“Our Father which are in heaven, Hallowed be Your name. Your kingdom come, Your will be done in earth, as it is in heaven” (Mat 6:9–10). “And I John saw the holy city, new Jerusalem, coming down from God out of heaven…. Behold, the tabernacle of God is with men, and He will dwell with them, and they shall be His people, and God Himself shall be with them, and be their God” (Rev 21:2–3). “And no man has ascended up to heaven, but He that came down from heaven, even the Son of man which is in heaven” (Jhn 3:13). “Being caught up” is not being taken from a low place to a high place as people imagine. This is a huge mistake. Being caught up is referring to My predestining and selecting. It is targeted at all those I have predestined and chosen. … This is most incompatible with people’s notions. Those who have a share in My house in the future are all people who have been caught up before Me. This is absolutely true, never-changing, and cannot be refuted by anybody. This is the counterattack against Satan. Anyone I predestined shall be caught up before Me. Entering into rest does not mean that all things will cease to move, or that all things will cease to develop, nor does it mean that God will cease to work or man will cease to live. The sign of entering into rest is as thus: Satan has been destroyed; those wicked people who join Satan in its evildoing have been punished and wiped out; all forces hostile to God cease to exist. God entering into rest means that He will no longer carry out His work of humanity’s salvation. Humanity entering into rest means that all of humanity will live within God’s light and under His blessings; there will be none of Satan’s corruption, nor will any unrighteous things occur. Humanity will live normally upon earth, and they will live under God’s care. When God and man enter into rest together, it will mean that humanity has been saved and that Satan has been destroyed, that God’s work among man has finished entirely. God will no longer continue to work among man, and man will no longer live under Satan’s domain. Therefore, God will no longer be busy, and man will no longer rush about; God and man will enter into rest simultaneously. God will return to His original position, and each person will return to his or her respective place. These are the destinations that God and man will respectively reside in after the end of God’s entire management. God has God’s destination, and man has man’s destination. While resting, God will continue to guide all of humanity in their lives upon earth. While in God’s light, man will worship the one true God in heaven. … When humanity enters into rest, it means that man has become a true creation; humanity will worship God from upon the earth and have normal human lives. People will no longer be disobedient to God or resist God; they will return to the original life of Adam and Eve. These are the respective lives and destinations of God and humanity after they enter into rest. Satan’s defeat is an inevitable trend in the war between God and Satan. In this way, God’s entering into rest after the completion of His management work and man’s complete salvation and entrance into rest likewise become inevitable trends. Man’s place of rest is on earth, and God’s place of rest is in heaven. While man worships God in rest, he will live upon earth, and while God leads the remaining portion of humanity in rest…. After God and man enter into rest, Satan will no longer exist, and like Satan, those wicked people will also no longer exist. Before God and man enter into rest, those wicked individuals who once persecuted God upon earth and the enemies who were disobedient to Him upon earth will have already been destroyed; they will have been destroyed by the great disasters of the last days. After those wicked individuals have been completely destroyed, earth will never again know Satan’s harassment. Humanity will obtain complete salvation, and it will only be then that God’s work ends completely. These are the prerequisites for God and man to enter into rest. God created humanity and placed them upon earth, whom He has led to the present day. He then saved humanity and served as a sin offering for humanity. At the end He still must conquer humanity, save humanity entirely and restore them to their original likeness. This is the work that He has been engaged in from the beginning to the end—restoring man to his original image and to his original likeness. He will establish His kingdom and restore man’s original likeness, meaning that He will restore His authority upon earth and restore His authority among all creation. … Restoring His authority means making man worship Him and making man obey Him; it means that He shall make man live because of Him and make His enemies perish because of His authority; it means that He will make every last part of Him persist among humanity and without any resistance by man. The kingdom He wishes to establish is His own kingdom. The humanity He wishes for is one that worships Him, one that completely obeys Him and has His glory. If He does not save corrupt humanity, the meaning of His creation of man will come to nothing; He will have no more authority among man, and His kingdom will no longer be able to exist upon the earth. If He does not destroy those enemies who are disobedient to Him, He will be unable to obtain His complete glory, nor will He be able to establish His kingdom upon the earth. These are the symbols of the completion of His work and the symbols of the completion of His great accomplishment: to utterly destroy those among humanity who are disobedient to Him, and to bring those who have been made complete into rest. 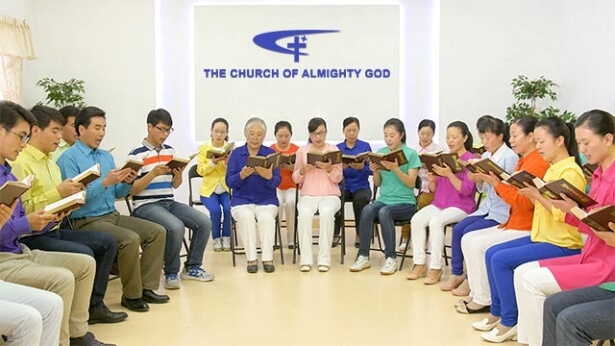 When humanity has been restored to their original likeness, when humanity can fulfill their respective duties, keep their own place and obey all of God’s arrangements, God will have obtained a group of people upon the earth who worship Him, and He will also have established a kingdom upon the earth that worships Him. He will have eternal victory upon the earth, and those who are opposed to Him will perish for all eternity. This will restore His original intention in creating man; it will restore His intention in creating all things, and it will also restore His authority upon earth, His authority among all things and His authority among His enemies. These are the symbols of His total victory. Henceforth humanity will enter into rest and enter into a life that follows the right track. God will also enter into eternal rest with man and enter into an eternal life shared by God and man. The filth and disobedience upon the earth shall disappear, as shall the wailing upon the earth. All upon the earth that opposes God will not exist. Only God and those people that He has saved shall remain; only His creation shall remain. Human beings, dominated by their satanic disposition, harbor some ambition and desire inside of them, which is hidden within their humanity. That is, humans never want to stay on the ground; they keep wanting to go up into the air. Is the air a place for a person to stay? That is a place for Satan, not a place for humans. When creating humans, God put them on the ground so that your daily lives could be completely normal and your lifestyles disciplined, and so that you could learn general knowledge about how to be human beings, and learn how to live your lives and how to worship God. God did not give you wings; He did not allow you to stay up in the air. Those with wings are birds, and the ones wandering around in the air are Satan and evil spirits and filthy demons. Those are not human beings! Previous : Why has the religious world always denied, rejected and condemned Christ, thereby suffering the curses of God? Next : What is true rapture?